Flexible displays are laminated graphics that are not attached to a substrate or other solid surface.Flexible displays are commonly used for wide format applications including trade show displays, maps, signs, and more.These graphics have the ability to be rolled up and easily shipped or transported for installation or display. Flexible displays are produced using a wide format laminator. 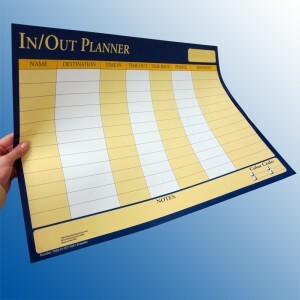 Flexible displays are created by applying a laminating film to the front of a print and typically include an additional laminating film on the back for added support and protection.Encapsulating the graphic by leaving a sealed edge around the print offers even greater protection against moisture and other environmental factors. D&K Recommends using Polyester or Vinyl/laminating films (thermal or pressure sensitive) for flexible display applications.